There’s no one perfect way to learn how to play golf. That’s because we all learn motor skills, eye-hand coordination, and the mental aspects of the game in different ways, at different stages in our lives, and with varying degrees of interest in the way the instructional materials are presented to us. This is all good for those in the golf instruction business. After all, if someone had come out previously with the one best way to learn the game, there would be no reason for all those competing approaches that we see on TV and read in the golf magazines and golf books. 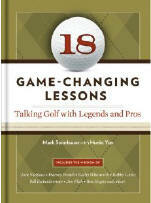 Long-time golf instructor Mark Steinbauer, working with Hunki Yun, appears to have a keen appreciation for all that variety, as shown in his new book, 18 Game-Changing Lessons: Talking Golf with Legends and Pros (Stewart, Tabori, and Chang; $19.95 SRP). The PGA pro is the Director of Golf at The Club at Carlton Woods, in The Woodlands, Texas. He taught golf at the Academy of Golf, the Nicklaus/Flick Golf Schools, and his own training center. Steinbauer also had a stint with Harvey Penick, his avowed mentor and the author of the best-selling “Little Red Golf Book”. Steinbauer has gathered together in his new book some of what he considers the best teaching tips for golfers of all skill levels, in each of the major parts of the game, from driving to putting. I like the way he structured these lessons. In segments such as the Jim Flick chapter called “Swing, Don’t Hit,” Steinbauer describes the basic point that Flick tried to impart to his students. Flick tries to make sure golfers don’t overcomplicate their game, while also understanding that not everyone can swing like a pro. Steinbauer then takes this central thesis and shows how high handicappers, mid-handicap players, and highly skilled amateurs can use this information at their particular skill level. There’s a world of difference between Dave Pelz’ scientific attitude toward golf, and Harvey Penick’s “Take Dead Aim” aphorisms. Steinbauer did some nice work in showing how these two very different teaching styles can help many struggling golfers, albeit to different degrees depending on their own ways of learning. There’s also a useful chapter on clubs and balls, also split among the three basic skill sets. This is a broadly practical golf instruction book. With no particular emphasis on a single way to play, it should be effective for a wide audience of folks looking to learn more about their favorite game.